The Asian Tigers are made up of four countries in east Asia - South Korea, Taiwan, Singapore and Hong Kong. They all went through rapid growth by going through industrialisation since the 1960s when TNCs looked for areas with cheap labour and low costs for other things. They are considered as the first generation of NICs. Japanese TNCs were among the first to seek new areas for their operations so they chose their less developed neighbouring countries, particularly South Korea and Taiwan as a host nation for factories and manufacturing. A reasonably well-developed level of infrastructures such as roads, railways and ports. Relatively well-educated population with existing skills. Cultural traditions that appreciate education and achievement. Good geographical location - Especially for Singapore as it is situated between the Indian and Pacific Ocean, which made it perfect for trading, imports and exports. Government support, for example, offering low-interest rates in bank loans. As the Economies of The Asian Tigers grew, large local firms began to grow, helped by the economic climate and government aid. Samsung of South Korea is one of the largest consumer electronics producers in the world and Samsung mobile phones have now become the major competitor of Apple's iPhones. All four of The Asian Tigers countries are now considered as developed countries. Although South Korea lacks natural resources, it had plentiful cheap and flexible workforce. The government realised that agricultural production was not the route to economic growth and so attracted large TNCs such as Sony from Japan and encouraged FDI from the US. South Korean firms were also produced by high import taxes which ensured sufficient market for goods and stimulated further production. The government also developed its own research and development of high-tech goods. Firms were attracted by a large consumer market of the South East Asia such as China. This has resulted in South Korea producing world-leading products and technologies. Hyundai, Samsung and Daewoo are some of the South Korean TNCs. Taiwan was also targeted by large TNCs. In the late 1960s the American toy company Mattel (famous for their Barbie dolls), wishing to lower its labour costs, moved its main factory to the island of Taiwan from Japan. This was one of the first movements of such large scale manufacturing factory by TNCs that was to make eastern Asia the workshop of the world. 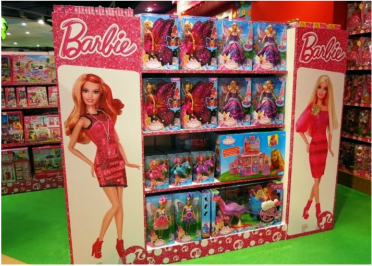 At one point, the Taiwan factory produced over half the Barbie dolls made. However, in the late 1980s, the rising incomes in Taiwan led Mattel to move on to countries with a cheaper labour force. Barbie dolls are currently manufactured in China, Indonesia and Malaysia. The Taiwanese economy has benefited further from globalisation and are thriving with their high-tech industries. Many of Taiwanese companies make world's laptops, personal organisers and MP3 players. When Singapore became independent from Malaysia in 1965, the population faced high levels of unemployment and poverty. GDP per capita was US$516 and half the population was illiterate. In response to this, the Singapore government established the Economic Development Board to make Singapore an attractive destination for FDI. Within the following decades, FDI increased rapidly and by 2001 foreign companies accounted for 75% of manufactured output and 85% of manufactured exports. The strategically located deep-water harbour is the ideal trade position linking routes from Europe to Australia and the west coast of the Americas. It now has a highly developed trade-oriented market economy and has the most open economy in the world. Singapore is now the highest ranked Asian country in the HDI (7th in the world) and have GDP per capita of US$55,182 (World Bank 2013). In the 1960s, the manufacturing industry opened a new decade employing large sections of the population. The construction business was revamped and it also used the textiles industry to boost its economy. Hong Kong is said to have the most attractive business environment within East Asia, in terms of attracting FDI. This has led Hong Kong to be the third largest recipient of FDI in the world. Using its profit, the government has built roads, schools, hospital and other infrastructures and services. Wages in Hong Kong are also relatively flexible. This has resulted in the GDP to grow 180 times between 1961 and 1997. Skilled labour force with modern British business methods (link to Britain due to former colonisation) and technology ensured that opportunities for external trade, investment and recruitment were maximised. It now has one of the largest port in the world. As the economies of these NICs grew, wage levels and the cost of operating within those countries began to increase. Therefore, the Japanese, US and European TNCs looked for second generation countries such as Malaysia and Thailand. TNCs from the first phase NICs also moved their manufacturing tasks to their neighbouring countries. China and India have emerged as targets for FDI by TNCs (as third phase NICs) and since 1990, both countries have shown rapid growth. Click next to find out more about China and India's industrialisation and economic growth.